Katia Ondas scarf knitting yarn, 98 in autumnal red and brown shades. 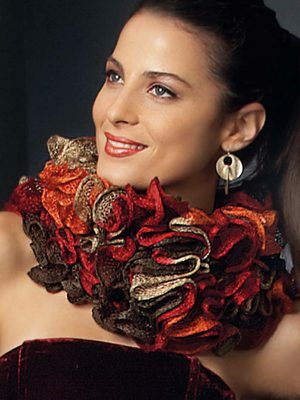 Make a stunning ruffled scarf from just one ball. Machine washable 30'. 100% acrylic. 4.5 - 5.5mm needles. 100g/ 30m per ball.Katia Ondas scarf knitting yarn, 73 in shades of turquoise, blue and green. Make a stunning ruffled scarf from just one ball. Machine washable 30'. 100% acrylic. 4.5 - 5.5mm needles. 100g/ 30m per ball.